Fox Rejects Vote Vets Ad; Times Nixes MoveOn’s. Why? An edgy ad could have broken through right-wing psychological barriers on climate change and alternative energy. Fox turned it down. When I first saw this ad—the accusatory male voiceover, black-masked terrorists, Ahmadinejad—I thought, "Oh, great, more swiftboating of Obama and the Dems for being ‘weak’ on national security." And though I now know, of course, that the spot was made by the progressive veterans group Vote Vets to push for a clean energy bill, whenever it comes on, my stomach still clenches as if it were an announcement that Liz Cheney had taken over the Rachel Maddow show. The ad is that good. Its red-state style allows its green message to penetrate anti-enviro skepticism as few lefty ads ever do. The idea that we need to move from oil to wind and solar to fight terrorism zips through rightwing psychological barriers like a sheep dressed in Fox clothing. So at first glance, it’s not surprising that, while MSNBC and CNN are airing the spot, Fox News rejected it. A Fox ad salesman told Vote Vets that the commercial is "too confusing.” And, in the largest sense, maybe he’s right: "Alarm," as it’s called, could connect viscerally with Fox viewers, but it speaks such un-Fox words. The ad itself, however—part of Vote Vets’ $1 million campaign—couldn’t be clearer, or nonradical. The basic argument is that if the U.S. were to lead the world to reduce its craving for oil, regimes based on little else would be weakened around the globe. Earlier this year, T. Boone Pickens, a Swiftboat consigliere, said as much in several ads pushing his plan to switch vehicles to natural gas (though unfortunately, they were tinged with an anti-Arabic tone). But what is confusing is that Fox News has run Vote Vets commercials before, and with the same message. Including this spot, called "Tough," launched just last month. It’s every bit as much of a Trojan horse in Fox’s hen house (or something) as "Alarm." Why, Bill O’Reilly and Dennis Miller more or less praised this spot. "I am blown away by that footage," Miller said, inadvertently explaining the gut-check that anything vaguely leftist must pass to even be heard by the right. "Anybody who puts themselves at risk like the first half of that commercial for me and my family can say anything they want on the backside of that commercial." Richard Smith, Vote Vets’ senior advisor, said both ads were designed with the Fox audience in mind. Fox News "usually portrays environmentalists as dirty hippies, they say climate change doesn’t exist, and blah, blah, blah. But there are a myriad of reasons to move on this issue even if climate change [isn’t part of it]." "The defense department is the largest purchaser of petrol products in the U.S.," meaning that it’s helping to fund its own enemies. "The Saudi regime," he added, "has a terrible human rights record, and this legislation is directly impacting their chief source of funding." Maybe that last reason explains why Fox News nixed the ad. Saudi prince Alwaleed bin Talal owns 7 percent of Fox News’ parent company, News Corp., the largest share outside of Rupert Murdoch’s family. But maybe not. Murdoch has burst out of the closet as a global-warming believer, and he’s pushing solar and other clean energy initiatives. Still, why reject "Alarm" but allow "Tough"? Has Roger Ailes, the real Decider at FNC, decided that "Alarm" is tougher than "Tough"? Fox hasn’t responded to press queries. Getting far less notice during the same week is the MoveOn ad that The New York Times refused to run. Above the headline—"The Supreme Court: Corporate America’s Newest Subsidiary? 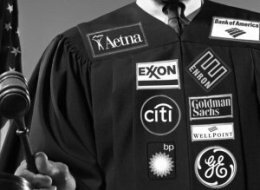 "—is a photo of a Justice’s robes pinned with the logos of Exxon, Aetna, Bank of America, Citi, Enron, GE, Wellpoint, BP and Goldman Sachs. The text goes on to call for a new Justice who will stand up to corporate power, especially in light of the Citizens United decision, which gives corporations "unlimited rights to pour money into electing corporate candidates who will protect their interests." The Washington Post ran the ad Monday, as Obama formally nominated Elena Kagan as a Justice. Why did the Times demur? Did it feel burned after running MoveOn’s controversial Petraeus ad ("General Petraeus or General Betray Us? "), which the Democratic-controlled Senate overwhelmingly condemned in a 2007 resolution. But unlike the Petraeus venture, the SCOTUS ad is not an ad hominem attack. Unless, of course, you define a corporation as a person—which the Supreme Court decision in effect does. A Times spokesperson explained its decision in an email: "We had no problem with the text of the ad… But we declined to run the accompanying photo, which pictured someone wearing a judicial robe with corporate logos on it. We felt it was inappropriate for the ad to include logos of corporations that had nothing to do with the decision." Nothing to with the decision? Not directly, that’s true, but those logos get to the heart of the Court’s ruling, which allows any corporation to swamp the airwaves, the internets, and, yes, the newspapers with unlimited cash, making the record $1.7 billion spent by all presidential candidates in 2008 look like chump change. And for the Times, as for all media outlets, those corporations are either advertisers or potential ones.